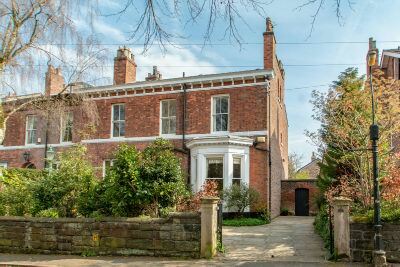 A UNIQUE OPPORTUNITY TO ACQUIRE AN EARLY VICTORIAN FAMILY HOME WITH MANY ORIGINAL FEATURES AND GENEROUS ACCOMMODATION EXTENDING TO APPROXIMATELY 4800 SQUARE FEET. It stands within a large, mature and private 0.20 acre south east facing garden plot, in a very convenient location. The house is set in the heart of the leafy and quiet Downs Conservation Area, so protected because of the beauty and historic character of the Georgian and early Victorian architecture. 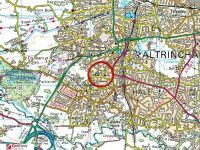 Yet it is within easy walking distance of the thriving town of Altrincham with its transport Interchange and Metrolink for commuting to Manchester; the Market House; a selection of excellent eateries and coffee shops along with a great variety of independent and high street shops. The core of Bowdon with its two pubs, café and community facilities is also close by. The green open space of The Devisdale is around the corner and leads to walks across to Dunham Park and the Cheshire countryside beyond. 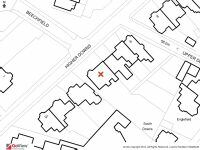 Equally the property is within walking distance of the Altrincham Girls and the Boys Grammar Schools; Bowdon Preparatory School; Altrincham Preparatory School; Loreto Grammar School and North Cestrian. There is quick access to the M56/M6 motorway networks serving the region and Manchester Airport. The wealth of period features includes elegantly proportioned rooms with high corniced ceilings; impressive fireplaces; decorative corbels; stained glass; sash windows and wide bays and an attractive hall with the staircase rising from it. The accommodation is extensive and versatile with three generous Reception Rooms arranged off the Hall in addition to the Breakfast Kitchen and Six Bedrooms over the two upper floors, served by Three Bath/Shower Rooms. There are four Cellar Rooms currently used as a Gym and for storage, which offer enormous potential to further convert into additional living accommodation subject to any necessary consents. This spacious family accommodation is complemented by the lovely garden, the size of which is really quite unexpected in a such a convenient location in striking distance of the Town Centre. Of particular note is the charming vista from all the principal rooms to the front towards tree-lined Beechfield and its historic stone Church. In detail the accommodation comprises. Hall. Sitting Room with bay window to the front. Double doors lead through to the Family Room with a French door to the Garden. Dining Room with front aspect. Door to the Breakfast Kitchen fitted with an extensive range of wood fronted units and with a garden aspect. Utility Room/Second Kitchen with garden access. Cloakroom and WC. First Floor Landings. Serving Three Bedrooms, the Family Bathroom and a Laundry Room. Principal Bedroom One to the front is served by and En Suite Shower Room. Spacious Bedroom Two overlooks the Rear Garden. Bedroom Three, also to the rear and currently used as a Home Study. The family Bathroom is enormous created from what was originally a Bedroom and is positioned to the front. A useful Laundry Room is conveniently located off the Landing. Second Floor Landing and Sitting Area providing a hub for the top floor accommodation making it an ideal quarters for teenagers. 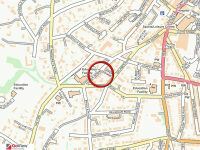 Three further Double Bedrooms are located under the eaves of the property with attractive sloping ceilings with beams. These bedrooms are served by the Third Bathroom. The four Cellars off a Hall with Rear Garden access, have generous ceiling heights and are ideal for conversion. Externally to the front, the Driveway is York stone paved and provides good off-street parking enclosed by maturely stocked borders. There is attractive gated access down the side of the property to the Rear Garden which creates a lovely haven of seclusion. There is a large York stone paved patio and a timber pergola sitting area, ideal for summer dining. It looks down towards the large expanse of lawn surrounded by mature borders and trees, retained within traditional brick walling which creates the classic Victorian walled garden. This delightful garden setting completes a very attractive and comfortable family home in one of the best locations in the Altrincham and Bowdon area.